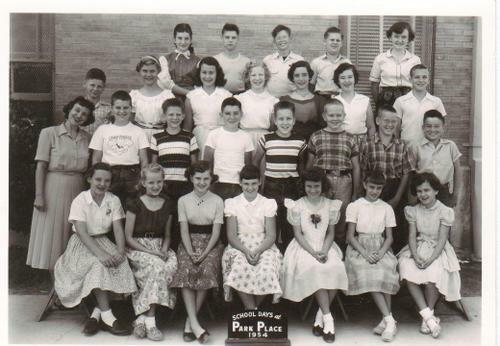 Perhaps more of the faces will be recognizable in this 1954 6th grade class photo, as we were maturing. 3rd row, L to R: Charles Pridgen, Linda Robinson, Pat Bain, Nancy Norred, Kay Knoblach, ? , ? 4th row, L to R: ? , John Gowan, ? , Paul Irwin, ? Billie Trombatore Young has identified the teacher as Mrs. Manley.